Ninth seed Carolina Marin defeated a valiant 11th seed P. V. Sindhu 21-17, 21-15 in a 47 minutes long contest to set up a summit clash with the top seed Li Xuerui at the World Championship being played in the Ballerup Super Arena at Copenhagen in Denmark. The match started very competitively, with both players testing each other. Scoring opened with Marin and she shortly built a nice looking lead of 6-2. But Sindhu was looking equally good all the while despite not getting scoring points on board. At this juncture, she fired six points in a row and went into a two-point lead from four points behind. Marin managed to break Sindhu’s spree and picked two straight points to equal the scores. The fight continued till 10-all at but Marin managed to go into the break with a solo one point lead. Riding on the psychological advantage at the break, Marin fired five straight points to disturb Sindhu’s rhythm. 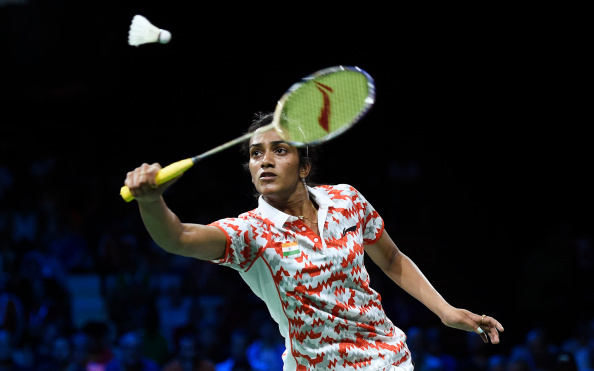 Trailing four points, Sindhu again made a couple of good strokes to take four straight points. But the lead conceded by Sindhu proved to be decisive as she found herself down 16-20. She managed to save just one game point and ultimately dropped the first game 17-21. Although the game was keenly fought, it was Marin who came out the better of the two competitors. The second game started in a similar fashion as the first. Marin opened the scoring again but Sindhu consistently kept putting pressure. The lead kept swinging back and forth between them. At the break time however this time Sindhu who had a solo point lead. Sindhu maintained the lead till 12-10 but Marin fought back, winning three points in a row and jumping into the lead. Sindhu equalized to make it 13 points each but that was all she could manage. An aggressive Marin showed tremendous courage to deny Sindhu any comeback. Marin went to a 19-14 lead and was only two points away from reaching the final. Sindhu managed to just get one more point as Marin ran away with the game 21-15. It took 47 minutes for the Spaniard to leave Sindhu with her second consecutive bronze medal. It was a magnificent display of courage in front of a great supporting crowd to see Marin do so well. She now faces current world number one and top seed Li Xuerui of China, who earlier in the day defeated Mitani Minatsu of Japan in a seemingly one-sided semi-final.